Unless the defeat in Napoli (2-0) and the draws in the derby and against Atalanta (both 1-1) the race to stay in Serie A is still completely open. Siena has 30 points and probably the most difficult opponents and both Palermo and Genoa have 29 points with a less difficult program in the last 5 matches. Pescara is almost definitively relegated to Serie B and two other teams have to follow them. In Napoli Genoa was without any chance. The team played with Immobile as a lonely striker and only because of Sebastien Frey we lost only with 2-0. 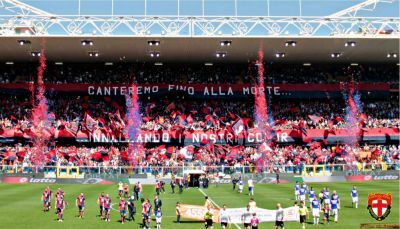 In the derby Genoa was for sure he best team in the field and we deserved a victory. In the first half Eder opened the score with a lucky free-kick that went under the wall against the post inside the goal. In the 80th minute Genoa scored the equalizer with a lucky shot of Matuzalem. 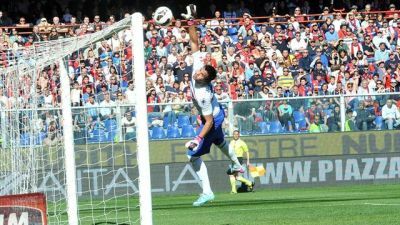 Just before the equalizer Costa of Sampdoria received his second yellow card, so Genoa had 1 extra player in the field. In the last fifteen minutes Genoa was a few times close to the winning goal, but it stayed 1-1 just as last week against Atalanta. This time Genoa opened the score with a header of Floro Flores after only 6 minutes, but 2 minutes later the equalizer was on the scorebord: 1-1. The rest of the match was played on the side of Atalanta, but we didn’t score again. Tomorrow Genoa plays in Verona against Chievo that beat Siena last week by 0-1.